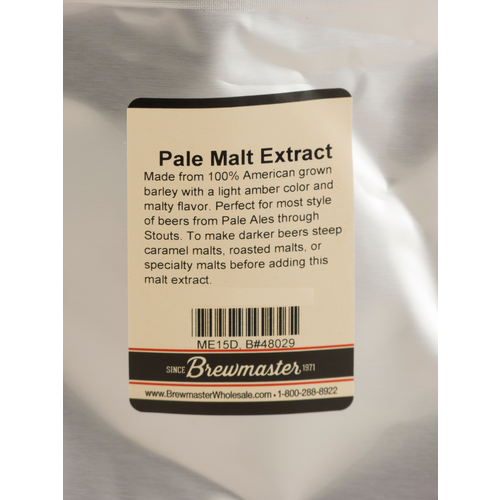 A little darker than Ultralight, the Pale Malt Extract has a more pronounced malt flavor. Made with American 2-row with Carapils added for body and mouthfeel. Perfect for Pale Ales, IPA's and all darker style beers. 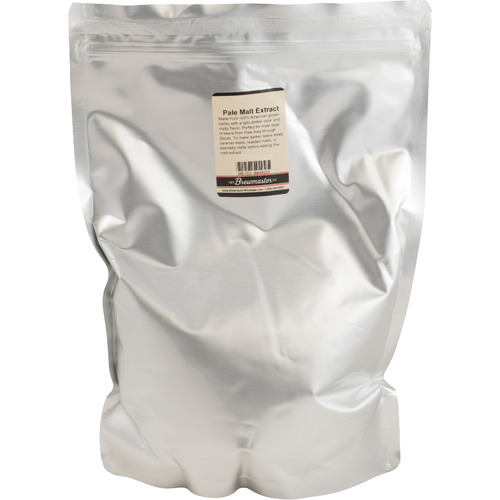 If you are making a darker beer you simply steep darker specialty grains to obtain the flavor and color you are looking for. I need extracts when making high gravity beers as I can't mash more than about 12 lbs of grains due to pot size. Makes a great IPA 9lbs = a healthy 6.5 gallon batch of beer. I use it for starters. Always fresh and I love the vacuum packed product. Holds well if I need to delay a brew day. I am not breeding all grain, so I required 12 lbs of pale base grain as 7 lbs of pale malt. A quick extract beer in the pipeline in between all grain. Good stuff but hard to measure out. I haven't used this new package yet but I have used it previously. It seems like good quality extract and has worked well for me in the past. 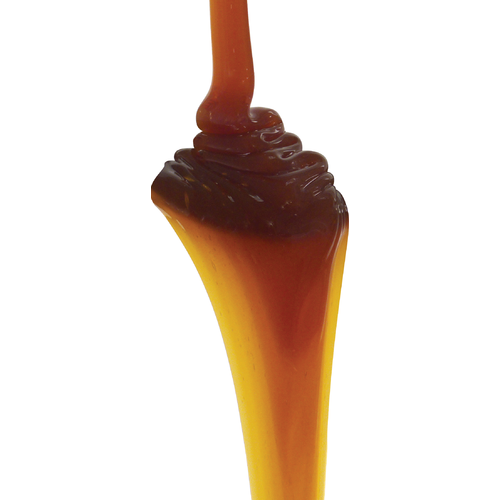 The downside of using any bulk liquid extract is that it is difficult to pour out a measured quantity with any precision, although if you measure out a little less than you actually want, you can weigh it and make up the difference with dried extract. I also have found that the empty bags seal up very well and are good for storing my homegrown hops without filling the freezer with hop aroma (which I like but my wife doesn't!). Thank you so much for your feedback. We really appreciate the honesty and value great feedback like this as it helps us improve our products. (Not sure if you've tried yet, but it might be a little easier to pour and measure if you warm it up a little in a bowl of warm water.) Cheers! Makes a good IPA. Easy to pour ot of the bag, very little waste. I like the amber color in the glass. The product is fine EXCEPT the packaging. I like the rigid containers that are so much easier to use. The flimsy pouch makes it very difficult to pour and rinse them to get all the syrup out without making a mess and getting everything sticky along the way. Not good if you don't use the whole package and want to store some. I love it. My breakfast with this malt extract is very nice ?? I've made 3 beers in a row with this stuff and all have turned out great. It helped get rid of that extract "twang" that I was tasting in many of home brews made with other extracts not from MoreBeer. So far this is the second extract from MoreBeer that I've tried but I love this one so much and it's so versatile that it's hard to switch to anything else. I made a brown, a black IPA and an Pumpkin beer using this extract and they were fresh and clean. Love it. It does finish pretty dry but still has the maltiness that gives it some character. Granted, I didn't do the side-by-side Pepsi challenge on these, but very high quality indeed. When making an extract, I like to put ~15% in at start of boil, and the other 85% in at the end. It limits the "extract flavor" in extract brews (just my own opinion, not fact, no hate mail please). I have made many excellent brews with this LME. I actually prefer some of LME brews I have made over some all-grains I have made. I have brought them to parties and shared them with numerous people and they passed up all of the micro-brewed bottled stuff for the stuff I brewed with MoreBeer LME and other ingredients. Thanks MoreBeer for keeping it fresh. Great extract malt. It tasted and smelled very fresh. It also attenuated well using a proper pitch of yeast and O2. I roll my extract bags like a tube of toothpaste to get as much out as possible. Also, to preserve a light color, I turn off my burner when adding extract to my boil. This prevents further caramelization.